The Daily Enlightenment » Should We All Monkey See Monkey Do? Home » Features » Should We All Monkey See Monkey Do? there is no need to fix it. Imagine some monkeys, and a ladder with bananas above it. Every time a monkey even touches the ladder, the others are sprayed with cold water. As a result, every other monkey would prevent any monkey from touching the ladder, sometimes even by attacking him. 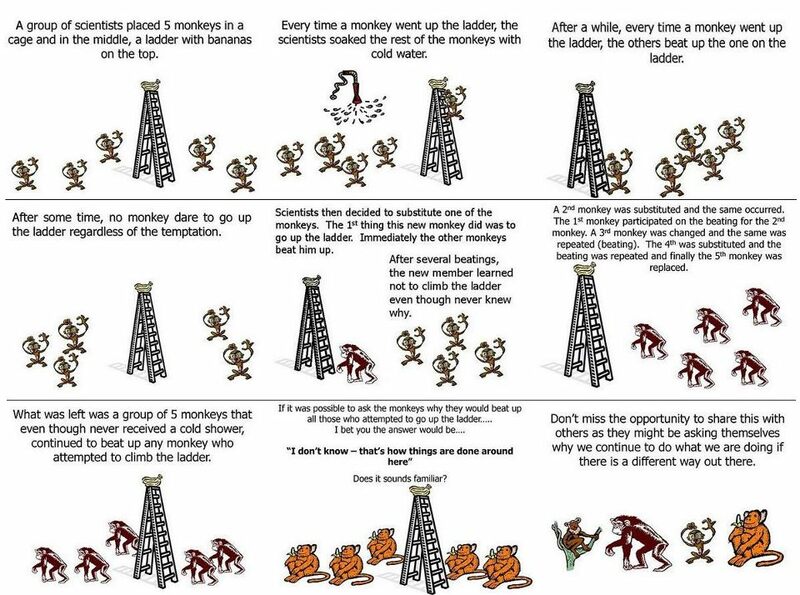 When the old monkeys are switched with new monkeys, the remaining ones, for their own comfort, will naturally condition them to fear approaching the ladder, often without explaining or remembering why. This can continue until all the old monkeys are switched with new ones, even when there is no more threat, experience or knowledge of the cold water. Eventually, there is just blind and literally ‘fruitless’ groupthink leading to the learned behaviour of following unwritten and pointless rules. Sounds quite human? In an interview, an associate of a much respected senior colleague reminisced of how he used to have lunch meetings with the latter, who would be critical of the food served, which would thus be changed – again and again, meeting after meeting. The day he had no complaints about the menu, everyone else present decided to stick to the same dishes – for all subsequent meetings. One day, when overseas with the senior, his wife suggested that he tried some different foods. There and then, it struck the senior that they had fixed menus back home, of which he asked why. The reason given was as above, that since he seemed finally satisfied with the set menu after many complaints, everyone thought it was best to stick to it. As the associate spoke with fond amusement, and not of further reflections, he probably missed two crucial lessons. First, the senior was critical for continual improvement, to not settle for second best, but everyone else settled instantly for what they saw to be ‘good enough’ to please him. Second, the senior was also not mindful of himself settling for what he deemed ‘good enough’, to the extent of not noticing the food stagnation till he came across foreign alternatives. Although he was critical, he was not self-critical enough, which inadvertently bred the conformity of ‘lunch groupthink’. Incidentally, all Buddhas, who spiritually out-evolved others to become fully enlightened are perfect challengers of samsaric groupthink, which is tainted with greed, hatred and delusion. Groupthink might create a sense of harmony for minimisation of conflict, but it is really stagnation of improvement, which misses the point of having a group – to have individuals come together for independent thinking out of the box to better situations. For what differing views are worth, they can be aired, debated, sorted and synergised for better outcomes. To all ‘safely’ yet irrationally stick to ritualistic routines to avert anyone’s displeasure could be symptomatic of the larger problem, of being stuck in comfort zones, to not even see the need for diligent search and fair evaluation of alternative solutions. Worse still, it might lead to instinctive suppression of dissenting views and actions merely for questioning the status quo. For a collectively more ‘fruitful’ future, may we never become mindlessly fretful or threatful ‘monkeys’! should welcome others to criticise them. also welcome others to criticise them. … ‘”He [LKY] had me sit in for lunches and dinners…” “One thing I noticed was that the menus for lunches and dinners were the same all the time. So I asked the Secretary to the Cabinet… why were the menus just so unchangeable, and he said ‘we had experimented in the past with different dishes, and they always had one criticism or other from Mr Lee, and here they came to this menu, and Mr Lee appeared quite satisfied with it. He no longer had any complaint about it.’ So they just stuck with it.